Digital Inclusion: Are you pleasing most of the people most of the time? We are delighted to bring this guest blog post to you from Chris Melia, senior learning technologist at the University of Central Lancashire (UCLan) about the work of Chris, and his colleague Kevan Williams in developing their innovative DigiLearn programme. 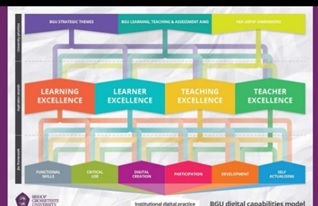 The technology enabled learning and teaching team at the university uses the Jisc digital capabilities framework to inform all their digital initiatives and their new digital capabilities mapping tool, DigiPath, is based on the six areas identified by the six elements within that framework. 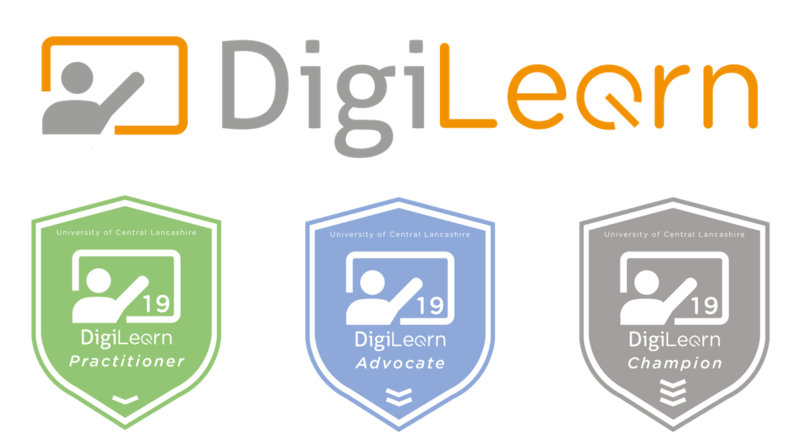 Developed by Chris Melia and Kevan Williams of UCLan’s Technology Enabled Learning and Teaching (TELT) team, DigiLearn is an institutional framework that encourages academic colleagues to both recognise and share best practice, as well as develop their own digital capability and skillsets. Underpinning the framework is a four-stage model (image below), containing two main elements. The first (below left) starts by looking at existing practice and ‘what works well?’, then recognising value and impact and sharing experience and supporting others, with an end goal of enhancing practice. 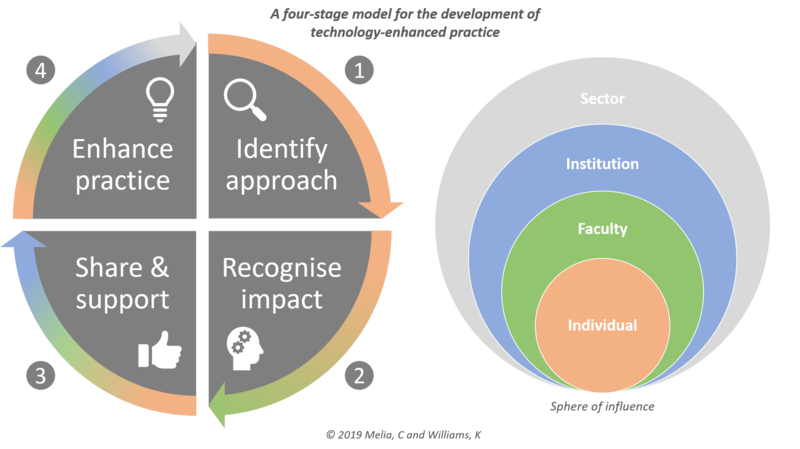 The second element (below right) demonstrates how one’s ‘sphere of influence’ expands as they move through the stages, from identifying an approach as an individual, right through to enhancing practice and influencing sector. This relationship is represented by the arrows surrounding the four stages of the model. At the heart of the DigiLearn framework are faculty-wide communities of digitally-inspired practice. These spaces encourage colleagues to overcome divisional barriers and engage in interdisciplinary conversation. Building on these principles, a framework was developed to again encourage the sharing of best practice, but also a promote a peer approach to digital development – with colleagues acting as each other’s digital mentors. The framework and accompanying role profiles are defined around three levels of award, appropriately titled to best represent the relevant level of recognition and achievement. Participating colleagues always start with the Practitioner route and progress upwards through the programme, with each level acting as a pre-requisite for the next. There are four parallel strands embedded across each level of award, the first of which sees colleagues participate in DigiPath, the university’s new digital capabilities mapping tool based on the six areas identified by Jisc’s digital capabilities framework. Additional criteria encourage colleagues to share best practice, initially at faculty level (Practitioner), moving on to institutional level (Advocate) and finally, sector level (Champion). This approach maps back to the ‘sphere of influence’ in the underpinning model, with an individual’s sphere expanding as they achieve the higher levels of the programme. The evidence submitted includes a combination of blog posts, written and video case studies, presentations and publications. As colleagues progress through the programme, they are also required to evidence how they have supported and encouraged peers to move along the framework. This mutually supportive, self-fuelling approach ensures that contribution and progression is driven from within the academic teams, with pedagogy recognised as the main driver to success. 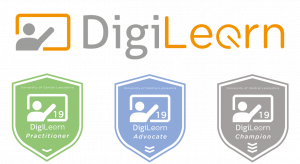 Since its initial Faculty of Health and Wellbeing launch in September 2018, the impact and momentum generated by DigiLearn has proven to be extremely positive. The video case study below demonstrates just some of the impact on colleagues across a variety of academic disciplines. The initiative offers the opportunity for continuing annual development, as more colleagues achieve recognition for their capabilities and worthwhile enhancements to the framework are identified and embedded. 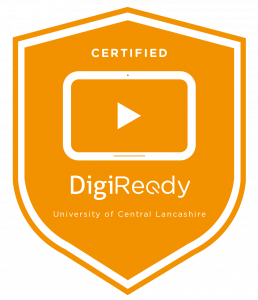 DigiLearn has become a recognised measure of personal achievement for academic colleagues at UCLan, alongside the benefits acknowledged by the university’s students of being part of an active, technology-enabled and digitally creative learning community. The next steps for UCLan, are to embed DigiLearn across all their academic and student development programmes and provide an online platform to share technology-enhanced practice across the sector. 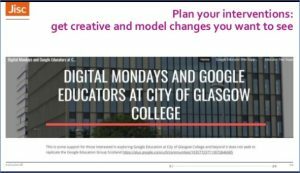 Posted by Clare Killen on March 27, 2019 in Digital capability, Framework. 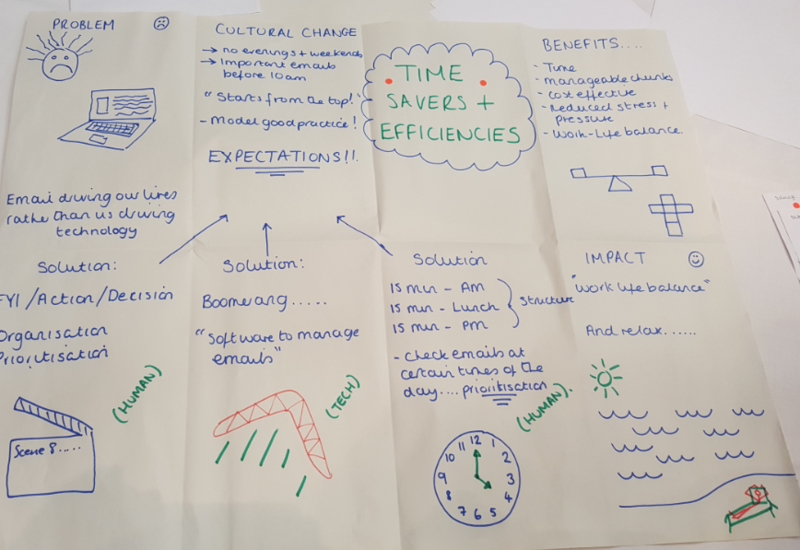 At the recent Digifest conference we ran a digital wellbeing design sprint session. This one-hour workshop was aimed as an introduction to the design sprint methodology and incorporated a focus on a particular wellbeing issue experienced by many, ‘email overload’. 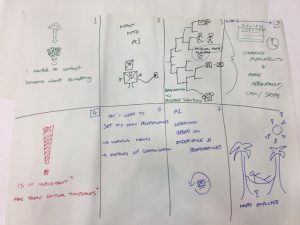 We thought that combining the design sprint and an issue in the digital wellbeing space would bring interesting ideas and solutions – and we were right! Design sprint is a process used for developing new products or services. It was developed at Google and is now being used and adapted in many organisations. A design sprint is a great way to get a cross institutional team in one place (usually these sprints last around 3-5 days), maximise learning and reduce failure rate when launching a new product or service. The sprint framework gives an easy way to navigate the six phases of the process (ranging from understanding the problem to validating a prototype with users). To give our attendees a real flavour of the design sprint in the very limited time available we concentrated on the process from understanding the problem to generating ideas and then creating a storyboard for the solution. We didn’t have time to do the prototyping and validation with users – but we still got some great results! Not surprisingly it seemed that all our participants were familiar with the issue of email overload. In order to understand and define the problem however, we used a simple technique of asking a series of questions using the five W’s and one H (5W1H: who, what, where, when, why, how). We then moved on to the individual work sketching ideas and solutions to the problem. 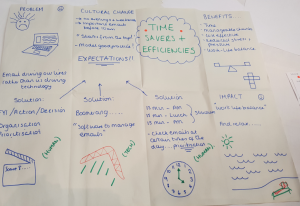 Having shared the ideas within their groups the delegates created a heat map of best solutions and worked collaboratively on creating the best solution to the email overload problem. The solution was then presented in a format of a storyboard. Here is a couple of the storyboards from the workshop. You can find the rest on Twitter #dwsprint. identify any gaps there are with the view to see what might be done to address them. We would like to thank everyone who came along to the workshop for their enthusiastic contributions. It was great to see so much interest in the design sprint method! If you would like to have a go at running a design sprint yourself we recommend having a look at the “Sprint – how to solve big problems and test new ideas in just five days” book by Jake Knapp, John Zeratsky and Branden Kowitz; and also the Design Sprint Kit. If you would like to keep in touch with the developments around the digital wellbeing project in Jisc you can join the project mailing list. 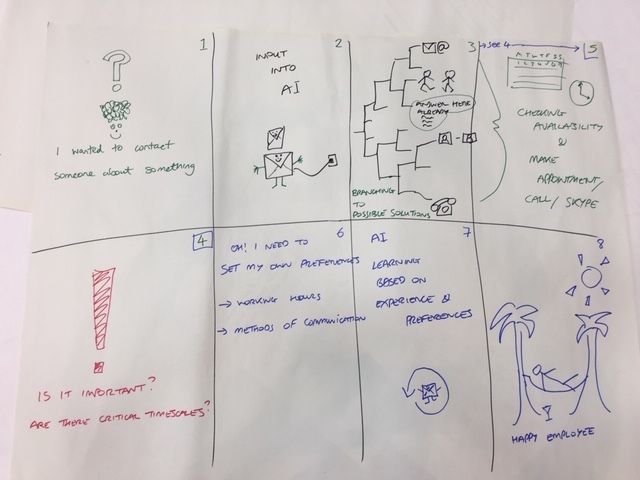 Posted by Alicja Shah on March 15, 2019 in Events and tagged design sprint, digifest, digital wellbeing. 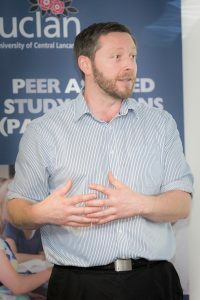 Thank you to Alistair McNaught, subject expert for accessibility and inclusion, for this guest blog post. I was struck by Alistair’s comment in a recent training event about the importance of accessibility and inclusion being considered as an integral aspect of digital capability. This really struck a chord as our digital experience insights survey reports for 2018 identified that 18% of staff and students said they considered assistive technologies as vital to their work or studies, or chose to use them optionally. That’s nearly a fifth of our staff and learners! The problem with digital capability is that it makes you think about technology. It shouldn’t. The real capability isn’t the digital, but what the digital does. Does it allow you to communicate more effectively with more people? Does it allow your students to consume course content on a range of devices? Does it allow them to rapidly scan the ideas in a long document and understand how they relate to each? Does it allow students with widely differing backgrounds and abilities to be independent, self-resourceful, stimulated, challenged? There is no doubt that digital tools and resources, used properly, can enable all these things. Equally, it can exacerbate existing barriers and create new ones if the focus is on the wrong thing. There is an assumption that if somebody is using technology confidently they are being digitally capable. This is not the case. I once visited Central America with a group of friends. One was an excellent communicator – in English – but knew scarcely a word of Spanish. His solution was simple and elegant. It was also completely ineffective. He spoke loudly and slowly in English with a Spanish accent. It had all the style of communication but none of the substance. Rural Nicaraguans didn’t speak English. Adding a Spanish accent didn’t help. But I come across the same types of misconception on a regular basis. So many college and university marketing departments put their prospectus online as an interactive flip book. Not one of the people who think this is a good idea have ever tried reading it seriously for information. I see learning platforms stuffed full of PDF documents – or PowerPoints converted to PDF – and I try tweaking them so I can read the more comfortably on screen, but I can’t magnify them without having to scroll left and right. I can’t use bookmarks to skim the content because there are none in the document. I try to listen using text-to-speech but the text can’t be selected. Too often, our digital capability is a triumph of style over substance, putting information online but retaining the barriers that stop it benefiting students who use assistive technologies, who need to access it on a different device, who need to change colours or magnification or simply need something more than text behind glass. It’s the pedagogical equivalent of speaking loudly in English with Spanish accent. We need to get back to the core of capability, beyond the tools to the task; to the “what digital does”. So here are some starting points. Digital does inclusion. There are well over 8 billion videos on YouTube. It is difficult to imagine that there is something that could supplement a PowerPoint slide or replace a handout. Moving from a monoculture of text to a wider range of media will help include more people from different backgrounds, cultures and literacies. Digital does navigation. Knowing how to properly structure a Word, PDF or web document using heading styles will allow every user to see the “map” of your document and instantly navigate around it without the burden of skim reading. Digital does personalisation. Does the content you create (or provide) allow end users to change the colours? To magnify significantly without having to scroll left and right? To select text for it to be read by assistive technologies? To access on a mobile phone. Digital does alternatives. If I can’t hear the video, can I read the transcript? If I can’t read the document, can I listen to it using text-to-speech? If I can’t write an essay could I produce a poster or video instead? The nature and form of our digital capability is increasingly important. In September 2018, the UK at adopted new accessibility legislation. It requires that websites, intranets, VLEs and their content should be accessible. Jisc is heavily invested in helping to shape the guidance our members will need. We have already contributed to a publication by the All Party Parliamentary Group on assistive technology on Accessible VLEs – making the most of new regulations. We help run a Jisc mail group on Digital Accessibility Regulations, and a Digital Accessibility Working Group for FE and HE, working with Government Digital Services to help ensure evolving guidance meets the needs of the sector. We have a series of online courses on benchmarking your digital accessibility and our Accessiblity Blog is a source of rich guidance – as is the Future Teacher project which we support. There’s a lot going on and digital capability will continue to evolve. But the digital capability of staff is only one part of the picture. 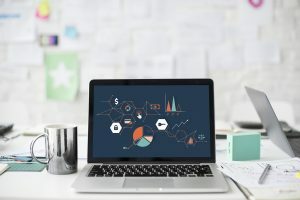 The Open University have been world leaders in the production of accessible online materials but they are increasingly coming against the logjam of student digital capabilities. You can have the most accessible resources in the world but if the end-user isn’t aware of how to benefit from that accessibility, there is still a job to do. making no difference to the quality of communication. I can tell you from experience… it doesn’t work. 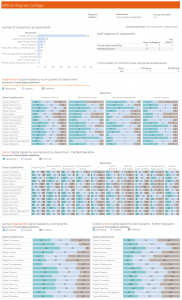 Posted by Clare Killen on February 13, 2019 in Uncategorized. 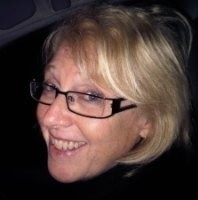 Chris is a Learning Technologist, working directly with UCLan’s Faculty of Health and Wellbeing as digital lead. 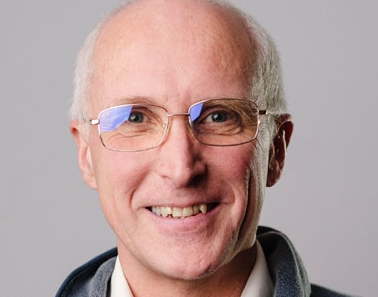 Currently an MIE Expert, MIE Trainer and Microsoft Certified Educator – Chris is an active member of the Microsoft community, regularly contributing and advocating the use of technology solutions in education. He played a key role in the deployment and development of Microsoft Surface technology across the University’s academic community. Chris is currently leading on a new initiative, which recognises the development of 21st century, digital skills to support students in their future employment. He is also an active member of the Association for Learning Technology (ALT) and holds Fellowship with the Higher Education Academy (HEA). Picture by Chris Bull for Association For Learning Technology 13/9/18. It has never been more important to prepare our students for the modern workplace by equipping them with future facing, digital skills. Following the Jisc Digital experience insights survey 2018, it was found that only 41% of students who were asked felt that their course of study ‘prepared them for the digital workplace’. In addition, only 40% agreed that they had regular opportunities to ‘review and update their digital skills’. At the University of Central Lancashire, the Technology Enabled Learning and Teaching (TELT) team have worked closely with our academic community to address these ever-growing concerns. 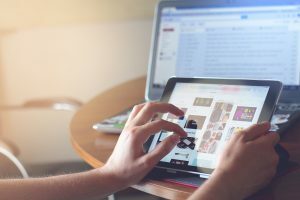 It was identified across several disciplines that students were already demonstrating a number of digital skills, often without realising themselves and normally without any kind of formal recognition which could aid their future employability. Our approach was to look at developing ‘DigiReady’, a new student certification underpinned by the Jisc digital capabilities framework (image above) and adapted from a more recent Microsoft tool. Implemented at course level, it centres around eight core skills ranging from effective communication, to online safety/security and profile management. Students build up their evidence of skill development across these areas, which they record into an e-portfolio using OneNote Class Notebook. 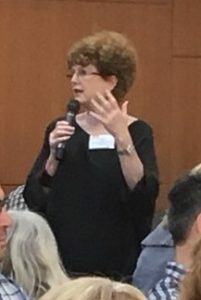 Evidence can consist of annotated screenshots, audio/video reflections, and sometimes involves different participation in interactive activities. The e-portfolio provides tutors with instant access to each individual student space, where they can monitor progress and provide valuable feedback along the way. 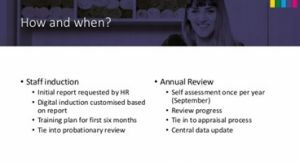 Students are also asked to build a short presentation or video answering three reflective questions, which draw on evidence from their portfolio and overall DigiReady journey and development. This final digital artefact aims to provide a valuable resource that will support students in their future employability. Jean Duckworth and Hazel Partington – both academics at the University, lead a suite of online Masters level courses and modules. Students arrive to the course or module with a range of different digital skill levels. Some may have studied or worked in a technology rich environment, whilst others have not yet developed their skills in this area. The team start the course with a very intensive induction, which starts with using Outlook, Microsoft Teams, Skype, Adobe Connect and the University’s Virtual Learning Environment. By doing this, students get to know each other and have the tools to fully engage in their studies. These skills are further developed as a student progresses through the course or module. While the initiative is still in an early pilot phase that will inform its future development, we know it will play a crucial role in the digital development of our students. 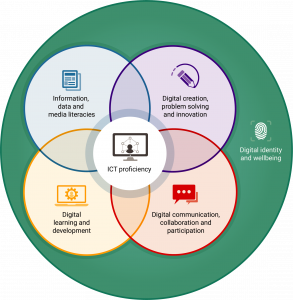 Posted by Shri Footring on December 17, 2018 in Digital capability, Institutional capability, Leadership, Staff student partnerships, Training and Development and tagged #altc, digital collaboration, digital communication, digital identity, digital literacy, DigitalCapabilities, higher education, ict proficiency. For those that were able to attend the Jisc building digital capability community of practice event held at the University of Hertfordshire last month, we were treated to a veritable feast of activities going on across our further education (FE) and higher education (HE) sectors on the theme of ‘digital skills and capabilities’! The insightful and challenging keynote, delivered by Professor Sal Jarvis and Dr Karen Barton, illustrated how impactful the experience of working in partnership with Jisc had been at a local level and how great our collaborative working has contributed to our strategic engagement with digital capabilities development at the University of Hertfordshire. Our participation in the Jisc student digital experience insights service (previously known as student digital experience tracker) and discovery tool pilots happened to coincide with a major transition to a new Canvas based Learning Environment implementation and they shared how all these initiatives had come together to influence our thinking and inform our evolving vision and aspiration to becoming a fully ‘digitally capable organisation’. Like many in our sector we have much existing excellent practice to celebrate, whilst we also acknowledge the challenging nature of supporting scalable and flexible digital capabilities development options as we move forward. The implementation of a new Learning Environment system had also provided a refreshed opportunity to review academic staff training and development in relation to course design and digital capabilities development. Dr Barton outlined the ‘Learning Landscape’ approach, developed by staff working in the Learning Technology and Innovation Centre, to support the delivery of academic training. The method and approach have now been adapted and extended to meet the needs of all our staff professional development and will include digital capabilities development in the future. Specific approaches to training academic and academic support staff in the effective use of digital technologies for learning and teaching are delivered through our Guided Learner Journey module developed on the Canvas platform. To engage academics, we have formed support teams of expert staff aligned to each school which deliver workshops, presentations and literally ‘knock on doors’ and ask if anyone wants any help! These teams comprise educational technologists, learning design champions, student technology mentors and librarians and have proven very effective in supporting the embedding and sharing of new practice! Gillian Fielding shared what the benefits were to organisations participating in the UCISA digital capabilities survey. By benchmarking local provision across the broader sector, it had helped members to prioritise and stimulate strategic thinking. Most recent results point to the need to reflect digital capabilities inclusion at strategic planning level, increase engagement by other departments such as human resources, and the need to stipulate digital capabilities more clearly within job descriptions and the recruitment process for staff and prioritising the delivery of digital skills for students as a key employability outcome. As well as being treated to an update from Jisc related to their digital wellbeing project and plans for their building digital capabilities services, we were then offered a full ‘smorgasbord’ of intriguing PechaKucha presentations and were dazzled by the awesome time keeping abilities of those presenting against the clock! The format was particularly praised as a method to share excellent practices happening everywhere. Dr Fiona Handley, University of Brighton, shared the research she had led on investigating staff student partnerships highlighting the types of activities which students get involved in such as digital content creation (videos), teaching digital skills training sessions, giving technical advice and presenting at conferences. She highlighted the fact that there was still some way to go in that most current projects are led by professional staff rather then led and driven by students. This highlights a need for us to consider how we might redress this balance and increase opportunities for more equal or student driven partnerships. Joe Wilson, City of Glasgow College introduced us to the City Learning 4.0 initiative aimed at preparing students for citizenship and industry. 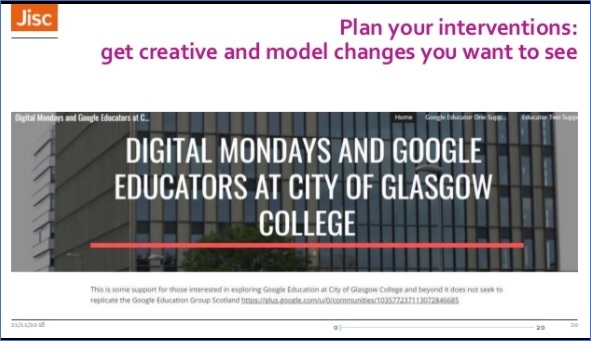 Creative initiatives such as the introduction of ‘Digital Mondays’ and Google Educators were important initiatives to stimulate engagement with staff and students. 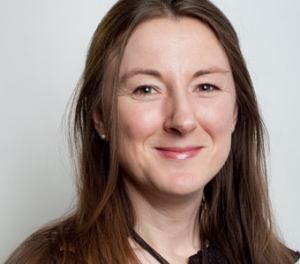 Terese Bird, Leicester Medical School, touched on the importance of adopting creative and considerate digital practices when designing and delivering digital learning. 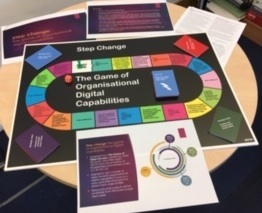 Clare Killen and I then delivered an interactive board game session based on an adaptation of the Jisc framework for organisational digital capabilities and the four-step model of strategic steps combined with a range of community-based case studies. The activity aimed to stimulate groupwork and problem solving whilst participants explored the 4 key steps of the framework through conversation, shared practice and reflective dialogue. We certainly got great feedback and you can now download of a copy of the game resources yourselves from the University of Hertfordshire Open access repository! We rounded the day off with more stimulating PechaKucha’s delivered by Sarah Sherman, Bloomsbury Learning Environment and how they had adopted a consortium-based approach to developing a brilliant Moodle course to prepare both staff and students to be ‘digitally ready for learning’ and teaching. Piloting in 2019. Finally, James Duke, Bishop Grosseteste University, shared the work they had delivered on building their organisational model and Alicia Wallace, Gloucestershire College, showcased how by engaging with the Jisc framework at critical points in the staff induction and annual review process in order to set goals, targets and deliver focused training and development. All the presentations, resources and outputs from the day are available from the Jisc building digital capabilities events page! Posted by Clare Killen on December 13, 2018 in Digital capability, Discovery tool, Events, Framework, Institutional capability. We are delighted to be working in collaboration with the University of Hertfordshire to jointly run this event, which will take place at on 21 November 2018 at the Fielder Centre. This event is our fourth community of practice event for staff and leaders responsible for developing digital capability in their organisations. 18 months on from the launch of this vibrant community, the network event offers a unique opportunity for colleagues to work together on all aspects of digital capability for staff and/or students. The network has over 100 active participants and an emphasis on leadership by the community, learning from each other and sharing what works. View our event page for programme details and how to register. Please note that registration is free but booking is required. Visit our website to find out more about the community and previous meetings. Posted by Clare Killen on October 22, 2018 in Uncategorized. We have had a busy summer preparing for the launch of our new building digital capability service and we would like to share with you some updates from the team. Registration is now open for our next Community of Practice event, running on Wednesday 21st November at the University of Hertfordshire. Everyone is welcome, please register now from our event page and we hope to see many of you there! Our new Building digital capabilities website has now been launched and is available from https://digitalcapability.jisc.ac.uk. You can access our range of advice and guidance from here as well as find out more information about the additional benefits the service offers, including the discovery tool, and how to subscribe. 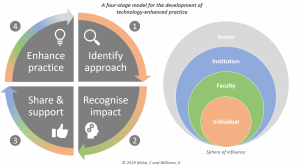 We have also developed a new role profile for Professional services staff in education, available with the other role profiles from https://digitalcapability.jisc.ac.uk/what-is-digital-capability/. For subscribers to the service additional pages in a ‘logged in’ section provide access to pathways through our advice, guidance, tools and resources. The updated version of the discovery tool is also now live at: https://jisc.potential.ly/ – with a free reduced version available to all staff (please note this is NOT for students as only the question set for staff is available in this free version). The full version of the tool is available for staff and students within subscribing institutions, see our website for more information on what is included in both free and full versions. Posted by Sarah Knight on October 11, 2018 in Uncategorized. 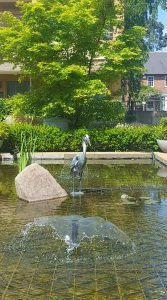 The University of Leicester provided a great setting for our third community of practice meeting. With eighty five delegates participating in person and many more joining in online (using the hashtag #digitalcapability) this was one of our most vibrant and productive meetings to date. This is a brief summary of the event. 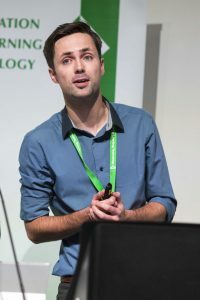 All links to slides, recordings and other outputs from these sessions are available from the Jisc event page. The three parallel community led sessions focussed on practical engagement strategies to engage students, senior leaders and human resource teams. This was an opportunity for participants to share their experiences, discuss with colleagues and identify opportunities for collaboration. The second keynote, How iDEA is developing digital citizens was delivered by Kerensa Jennings from the Duke of York Inspiring Digital Enterprise Award (iDEA). Kerensa gave an overview of this international programme which aims to help address the digital skills gap. She explained that all iDEA resources are free to use and are being increasingly taken up by UK FE colleges and other learning providers. Overall, I was struck by the sense of energy throughout the day. This was evident in the keynotes, presentations and workshops as well as the depth of questions and conversations throughout the day. Delegates mentioned that they found the keynotes, presentations, and the opportunities to network and share ideas particularly valuable. This is a community led event and we are really keen to work in partnership to run the next one, due to be held in November 2018. Please get in touch with us in the team if you might be interested in hosting the next event. Posted by Shri Footring on June 11, 2018 in Digital capability, Events. Digital discovery tool: please give us your feedback! Over the last few weeks we’ve been immersed in individual feedback on the experience of using the Digital discovery tool. This has meant some significant revisions to the content and format of the questions for staff, as described in an earlier post. As we are now at the end of the pilot we’ll be able to compare feedback since the changes were made and see if users find them to be an improvement. (Remember you’ll still have access to the tool till the 13th July). Some of the same issues have been recorded by our student users, along with some new ones such as relevance to different subject areas. We’ll be reporting back on this feedback shortly, with our planned response. You’ll have an opportunity to hear more about individual staff and student responses in our webinar at 12.30 – 14.00 on Tuesday 19th June (links to follow). Now we are keen to hear about the experience of our lead contacts and how the Digital discovery tool has been used at organisational level. We have just launched the evaluation form (you will receive a personal email with a link to this). All the questions are optional, to help you focus on those areas where you really have something to day. But of course the more you can tell us, the more we can improve. In particular, we ask about any evidence you have that use of the Discovery tool has led to change, either for individual users or more generally in the organisation. It’s really helpful if you have carried out a focus group or consultation event, and there are resources to help you do this on the evaluation page of this site. There’s also a handy reminder here of the evaluation process overall. And Shri’s recent blog post covers some of the organisational issues you might be thinking about as you compose your feedback. There is a whole section of feedback about your experience of using the organisational data dashboard, so it’s a good idea if you have downloaded your most recent data and thought about how it might be used. See our guide on how to download the data, and blog post on Making use of your data. We’d appreciate all organisational responses by the 29th June, as we’ll be analysing these results shortly after. There’ll be an opportunity to hear and discuss our findings at our second webinar on Thursday 19th July, 12.30-14.00. Posted by Helen Beetham on June 6, 2018 in Discovery tool. 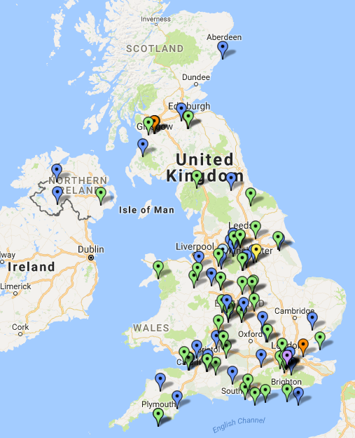 Over one hundred universities, colleges and other providers are piloting the Jisc Digital discovery tool in the UK and overseas. The design of this tool encourages individuals to reflect on and develop their digital capabilities. It provides a summary of their self-assessment in response to nuanced question prompts as well as suggestions for further development with links to relevant, interactive resources. Whilst it is very much a personal tool, additional features allow institutional leads tasked with supporting digital capabilities development to gain insights from anonymised data and translate them into the institutional context. Jisc team members have visited several pilot institutions to support the implementation process. In doing so, and through our in-depth conversations, we have learned about what works, at a practical level, when it comes to providing opportunities to develop the digital capabilities of staff and students in the various organisations. Further insights have emerged from conferences, events and meetings featuring presentations from our pilots, for example, the Student Experience Experts meeting and the Digital capabilities session at Digifest18. We are seeing that the organisations with a clear message about the importance of digital technologies, communicated and understood by everyone, provides a meaningful context for the use of the discovery tool. Having a safe space in which teams can explore their thinking about their own priorities for development creates an environment in which individuals can thrive. Establishing the connections between individual self-identified aims, the overall picture for all staff and the resources available to support professional development to meet organisational strategic aims. We wanted to identify gaps in staff confidence in their digital skills and use this information to target staff training and support. We looked at other products but there was nothing really out there to meet those requirements. We were looking for a standardised tool and wanted something to self-motivate staff. The approach taken by the Digital discovery tool supports that. The next digital capability community of practice event is being hosted in partnership with the University of Leicester on 22 May 2018. This provides an opportunity to learn about related initiatives and hear more from the wider community including many members who are taking part in the pilot of Digital discovery tool. While registration for this event has now closed, the keynote sessions will be live streamed. Follow the hashtag #digitalcapability on the day and presentations and any outputs will be available from the event page. If you are part of the pilot, you still have time to engage staff, perhaps through end of term staff development events. Remember that feedback is required by the end of May but the Digital discovery tool will continue to be available until 13 July 2018. Posted by Shri Footring on May 16, 2018 in Digital capability, Discovery tool and tagged #udigcap, DigitalCapabilities, DiscoveryTool.